The Dallas Cowboys considered kicker to be a budget position at the eve of free agency, and after the reign of Roger Ruzek was officially over went through a string of kickers including controversial Luis Zendejas who had a bounty placed on his head by the Eagles. 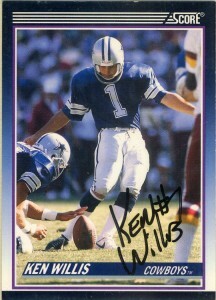 The team would have an open tryout in 1990 and bring in free agent Ken Willis from Kentucky in training camp. About nobody gave him a chance to win the starting job but by the end of camp he’d have the job cemented over. 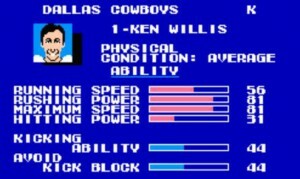 Willis was a likable guy for the Cowboys, and his two seasons for the team were serviceable. While not connecting on a field goal of over 50 yards his rookie season in 1990, 1991 on the other hand would result in Willis making a career high 39 attempts which would be a team record. He would also connect on 4 of 7 from greater than 50 yards. He’d also be the second leading scoring kicker in the league behind Chip Lohmiller. These would all be career highs for the young former Kentucky Wildcat, who signed with the Tampa Bay Buccaneers for a ludicrous 1 million dollars in 1993. (The Buccaneers were desperate for the best available talent after losing kicker Steve Christie to Buffalo and reached out to Willis.) The Cowboys left Willis exposed on free agency and Jerry Jones was irritated because he had a ‘gentleman’s agreement’ with Willis and punter Mike Saxon among others not to sign with other teams. (Jones offer was a measly $175,000. Willis would have been an idiot not to have taken the Bucs deal.) The Cowboys moved on however, and so did Willis. Unfortunately Ken’s tenure in Tampa was incredibly short being 1 of 4 from 30-39 yards and missing 3 critical kicks against the Vikings sealed his fate. Willis would shuffle on up to play for the New York Giants but would suffer a career ending stress fracture of one of his legs. Willis would retire at the age of 26. Unfortunately due to his painful injury Willis wears shin splints to this day and lives in relative anonymity teaching high school Algebra in his home state.